A beginner course is not just beneficial for complete novices, it can also be beneficial for someone wanting to get back into yoga after a prolonged absence or injury, and is also a great course to take if you want to learn to better your technique and alignment, enabling you to understand the mechanics of the pose to help you go deeper into it while protecting your body in the process. Our 8 week beginner yoga course is one of the best in Auckland and consistently sells out. This course offers a glimpse into the 8 limbs of yoga as prescribed by the ancient sage Patanjali in the Yoga Sutra. We will focus on correct alignment in a posture, how to breathe and move in and out of a pose safely and effectively, and then move into more flowing and challenging sequences like sun salutations, vinyasa style asana (flowing from one sequence to another), and also tackle the stronger warrior series. Each week we will add to your knowledge, build your skills, strength, flexibility, and balance, while providing you with a personal understanding of yoga as a philosophy, enabling you to walk into any yoga class and confidently and comfortably work with your body in a safe and productive manner. Unlike the casual classes, the 8 week course is a 90 minute long session each week to ensure you get the most out of the course. The cost of the course is $150 for the full 8 weeks . Bookings are essential as spaces are limited and often sell out rapidly. 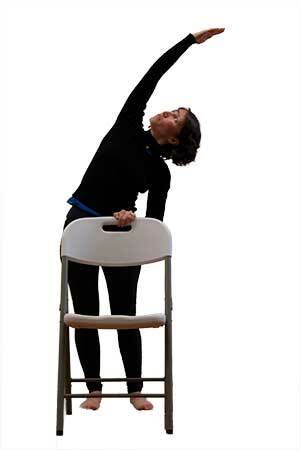 Chair yoga is suitable for everyone but especially beneficial for the elderly, those who are physically less able, recuperating from injuries, or those wishing to move into full yoga asana practice but wish to build strength and balance in their joints and muscles first before taking on a more strenuous workout. It is also a satisfyingly relaxing release of the joints and muscles for those who attend a normal yoga class and want to take care of their joints. A beautiful and gentle exercise with far reaching benefits for all that practice it. This class is wonderful for releasing stress and tension as we always end our sessions with a long relaxation practice. There are stairs down to the room, so this is unsuitable for those in wheelchairs or people who find stairs hard to navigate. Everyone is welcome, no bookings necessary. Our most popular class of the week. This class is suitable for all levels, and is all about lengthening out those limbs, releasing your tightness, building strength gradually, and utilising proper breath techniques (pranayama) to eliminate toxins from the body, leaving you with a toned relaxed body and a calm mind. Shoulders, hips and everything in between will thank you for it! Strengthen and lengthen is exactly that, a delectable morning class that helps you work on your flexibility and build strength. This is a great class for people of all abilities, whether you suffer from tight hips and hamstrings, or sore backs and shoulders. This class will help you find some relief or just give you that lovely morning pick me up to set you up for a great week. This class is for the stronger, fitter practitioner, or those that are looking for that extra challenge, some body sculpting and a good ol' workout to break a sweat and build up your cardio fitness. Each class will have 3 - 4 HIIT sequences, each sequence lasts 4 minutes but is broken into 8 segments of 20 seconds of full on movement and 10 seconds of rest. This gets the fast twitch muscles firing and burning to create a leaner stronger body, with rapid response reflexes. Generally we target the slow twitch muscles in yoga asana which helps build endurance, flexibility, and strength. A 20 minute HIIT workout is equivalent to a general 2 hour workout, plus your metabolism will be working for the next 48 hours which means your body will be burning calories over that period . BONUS! We will warm up with some great vinyasa flows, weave them between the HIIT segments and finish up with a lovely warm down and relaxation. Bring a towel and a drink bottle! No bookings necessary. But you do need to be familiar with the basic postures, and be prepared to work hard. "Yin yoga classes are slower paced with postures held for longer periods, 3 -5 minutes, and sometimes longer. This engenders a meditative quality with an emphasis on inwardness and expanding awareness of the body’s process and sensations. Students learn to become more present during practice, and they learn how to release muscular effort by relaxing and surrendering into the pull of gravity." - Paulie Zink- founder of Yin Yoga. Yin Yoga works the fascia and targets the connective tissues, such as the ligaments, fascia,bones, and even the joints of the body that normally are not exercised very much in a more active style of asana practice. Suitable for almost all levels of students, Yin Yoga is a perfect complement to the dynamic and muscular (yang) styles of yoga that emphasize internal heat, and the lengthening and contracting of our muscles. Yin Yoga generally targets the connective tissues of the hips, pelvis, and lower spine. Don't be fooled by the apparent passivity of this practice, Yin is a challenging practice as you must learn the art of letting go and being still, watching your thoughts and allowing your body to release at its own time and pace. Yin is NOT restorative yoga, if you are injured please allow your body time to heal before attempting any asana practice. Everyone is welcome, no bookings or experience necessary. state of catching up? Join Francesca at the Yoga Pantry. and harmonious life. Awareness is the first step to tap into your personal abundance. healing of all the aspects of the body. Hatha Meets Nidra - Energise first, relax and rejuvenate after! Hatha yoga is the yoga of force, in that it requires effort to obtain positive results, but don't let that put you off, anything worth doing requires effort, and effort need not be something we do not enjoy. Hatha yoga is about strengthening the body through precise poses, fortifying the mind and preparing you for the more rewarding and transformational process of meditation. Yoga Nidra is a technique adapted by Swami Satyananda from the traditional tantric practice of nyasa; it is scientifically proven to deepen relaxation, aid stress management and lower high blood pressure, to name just a few of its benefits. It can harmonize the deeper unconscious and awaken inner potential, but overall, it's a spectacular method to release yourself from your habitual patterns. It's suitable to all practitioners, without previous experience required. The practice is entirely performed while lying in a comfortable position. Everyone is welcome, no experience and no bookings necessary. When we enter this world we take a deep breath in and create a vibrational resonance by crying and moving as we start to express ourselves as a being, embodied in our chosen combination of cells. This class celebrates the principle that you are a unique and important expression of the divine everything and supports you to enjoy being you and your body. We recognize the changing seasons, moons, moods and needs by incorporating elements of traditional Hatha yoga,Qi Gong, meridian theory, yin yoga, pilates and more. There will always be an invitation to do what feels best for you as we engage with breathing practices and pranayama, make mantra chanting and sounding (song), and use movement, tradition and philosophy to connect to the life force as it moves in us, around us and between us. This is a slow flow class where we take the time to breath while paying attention to our alignment. Sun Salutations are always included in this class. Creating space and building strength throughout the whole body as we flow through the asanas. We close the class with a beautiful guided Savasana as we absorb the benefits from the practice. A lovely class aiming to feel calm, more centred and open. This is a lovely stretch and flow class to get you moving, and gently ease the body into your Friday. We start off with some breath centring then gradually work out the kinks with some satisfying yoga flow. Tash usually also incorporates some energy medicine into this class to tune you up and put a pep into your step. A short savasana at the end will ensure you are rested but not drowsy so you can get the most out of your day and be ready to have a fantastic weekend as well. Each class will start gently warming up the body and progress you through some simple and beneficial poses. We finish off the class with relaxation/meditation and pranayama (energy/breathing technique). You will bring flexibility and release to the tight areas of the body, while also enjoying the restorative aspects of a gentle practice. This class is perfect for the novice that wants to take time building strength and flexibility and work at a slower pace. Or the more experienced yogi that wants to build suppleness into those areas of tightness and tune out the week while pressing the reset button. A lovely way to end the working week, de-stress, and set you up for a brilliant weekend. Everyone of all levels welcome, no experience and no bookings necessary. Meditation or chanting mantras in groups is a wonderful way to stay focused and in the moment, sharing the energy and vibration of mantra is a powerful way to connect to spirit and heal the body, you will end these sessions feeling uplifted and calm. Mindfulness is the intentional accepting and non-judgemental focus of one's attention on the emotions, thoughts and sensations occurring in the present moment, which can be trained by meditational practices, helping us become more present and more able to stay in the moment; which leads to a more fulfilling life experience. All our classes emphasis mindfulness and incorporate mini meditations. However you can join us on Saturday mornings at 9am for a 20 minute guided meditation class. Open level class, suitable for those who are physically fit and have some prior knowledge and experience with yoga asana. This is a general class with a variety of postures including pranayama, relaxation and mantra. No two classes are exactly the same. Modifications are also incorporated to suit all levels of experience. Bring your issues :) anything you'd like to work on or work out, let Tash know so she can incorporate it onto the class plan. This is a beautiful way to recharge after a busy weekend. Join Cheryl for a lovely hour of stretching, breathing and releasing all the tension that builds up in our bodies due to our over scheduled lives. Stretch your weekend by giving yourself time to unwind, stretch out, and tune out the demands of your busy life. This class is suitable for all levels, no experience is necessary and your whole family can join in and enjoy this wonderful session together. Intermediate level class to take you to the next level, helping you work on your transitions, those harder more complex poses, while continuing to build strength and really nailing those rules of alignment, you will also get the opportunity to work on some more complex pranayama techniques, inversions and arm balances. Booking required to secure your spot, sign up to our newsletter to get notified when the next course will be starting. A series of short courses designed to target specific body parts or actions. Run periodically from time to time. This series is designed to challenge the more advanced practitioner as well as allow us to target specific needs, such as hip openers and shoulder stretchers, balancing poses and inversions or learn specific routines to add to your home practice.